You may have seen pictures floating around social media today of lots of folks sporting their sunglasses in an effort to raise awareness and acceptance in celebration of World Autism Day #BeCoolForAutism. 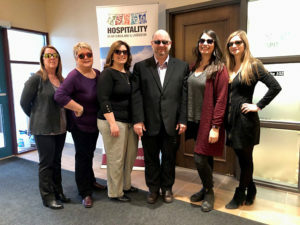 Here at Tourism Quality Assurance, we also teamed up with our friends at Hospitality NL to partake in the campaign by sharing our photo! April 2 is World Autism Day and it’s a great time to remind tourism operators that we can all do little things that can make a big difference for guests with disabilities. Hotel Port aux Basques is a great example of a business that took steps to welcome guests with family members on the Autism Spectrum. Cathy Lomond, owner, indicates that there were some very simple changes like ensuring there was a latch lock that was located higher on the door, having safety latches on the dresser drawers and having a picture menu in the restaurant! *Special thank you to Joan Chaisson with AIM – Autism Involves Me for helping develop these Autism Friendly tips for tourism businesses! If you would like to see the very cool, sensory room and the Autism Friendly accommodation at Hotel Port Aux Basques, check out this video on Canada’s Most Autism Friendly Town. Thanks for checking in with us for this week’s QualityTip4Tourism! If you have a suggestion for a quality tip that you would like us to share with others in the industry, please contact us!